Moderate or high grass pollen risk UK. 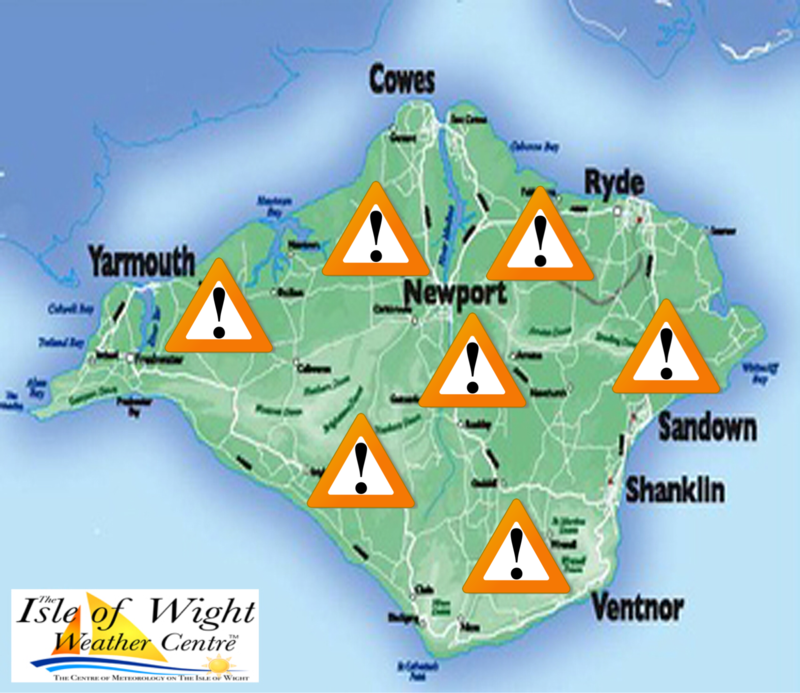 Rain will cause the risk to decrease locally. Many sufferers may experience symptoms of hay fever when the grass pollen risk is moderate. The pollen index is supplied by the National Pollen and Aerobiology Research Unit. The pollen forecasts are made using information from the National Pollen Network, local vegetation, weather patterns in the winter and spring that influence grass growth, and the weather forecasts. 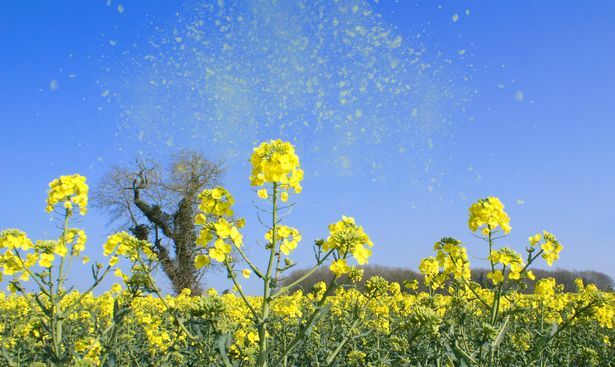 The pollen forecasts can help hay fever sufferers to plan their activities and medication. It is important to note that this is an index of the risk of being affected by airborne allergenic pollen and is not the actual pollen count. During the spring months the main problem for hay fever sufferers is tree pollen. Some types such as alder and hazel, can be in the air as early as January. These types are followed by elm, willow and ash in March. Pollen from these trees affects only a small percentage of hay fever sufferers but can cause symptoms in some allergic people. The pollen from silver birch trees is the most important tree pollen type for hay fever sufferers and usually occurs in April. This pollen type affects about 25% of hay fever sufferers. The season usually lasts for about four weeks and counts will be high on dry, warm days with some wind in areas where there are birch trees. The birch tree pollen season is followed by the oak tree pollen in late April and early May, although oak affects fewer sufferers than birch. The most important pollen type for hay fever sufferers in the UK is grass pollen. 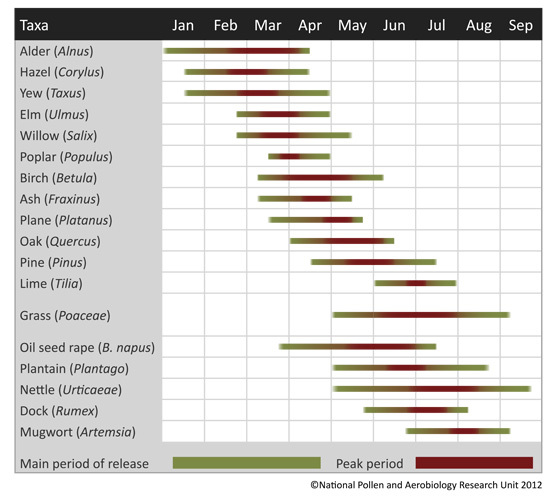 This season starts in late May and continues through to mid August, with the main peak occurring usually in June and a second smaller peak typically occurring in early July. About 95% of hay fever sufferers are allergic to grass pollen. The amount of grass pollen in the air can differ a lot from day to day and even within days depending on the weather. The pollen grain is the structure used to transport the male gamete (i.e. male DNA) to the female part of a flower. Pollen must be strong to protect the male gametes on their journey. The outer wall of the pollen grain, called the exine, is composed of a very unusual substance called sporopollenin which is very tough. The inner layer is made of cellulose and is similar in construction to an ordinary plant cell wall. Pollen grains are microscopic - usually about 15 to 100 microns - and just a pinch of pollen powder contains thousands and thousands of grains. Each pollen type has its own unique set of characteristics which means that the species or plant family can usually be identified. In the case of grass pollen, the different species are more recently evolved and their pollen grains are very similar to each other and so are usually only identified as grass in the count. The main features which distinguish one type of pollen from another are size, shape and ornamentation of the outer wall. 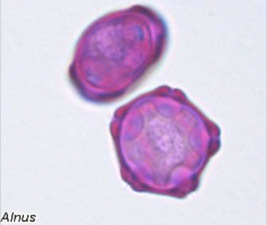 Pollen grains come in a wide variety of shapes although the majority are basically spherical or oval or disc-shaped. The outer wall features include pores and furrows, e.g. grass has one pore and no furrows, birch has three pores and no furrows, oak has three furrows with a pore in the middle of each one. The surface of the grain can also have a meshed, granular, grooved, spined or striated surface or can appear very smooth. Most species of pollen have some level of allergenicity but some are particularly notorious for inducing symptoms of hay fever. Grass pollen affects about 95% of all hay fever sufferers and birch tree pollen affects about 20%. Oak tree, plane tree (common in many streets in London) and nettle pollen are also well known for their allergenic properties. One of the most allergenic species on an international level is the wind-pollinated ragweed. This is currently rare in the UK but is frequent in parts of the U.S.A., Canada and Europe. It produces a huge amount of pollen - up to 8,000 million pollen grains can be released in just 5 hours from the giant ragweed species. Wind pollinated plants do tend to produce masses of pollen to ensure that at least some of it reaches the right target. The majority of flowering plants are insect-pollinated and so their pollen does not need to be dispersed on the wind and they therefore produce smaller quantities of it. The pollen from these insect-pollinated species is often sticky to adhere to the bodies of insects and can form clumps making it visible to the eye which often makes people assume that this is the pollen type causing their symptoms. While such pollen does have allergenic properties, the chances of it reaching the nose are usually slim. So, it is the wind-pollinated species with their insignificant flowers (usually greeny-yellow and small) producing millions of pollen grains that mainly cause the hay fever symptoms and trigger asthma in those susceptible. In all, about 15 species that are known to be considerably allergenic are seen each year on the slides from the pollen traps in the UK. There are about another five that are regularly seen but considered to be less of a problem. The traps also collect very small numbers of some other species, usually those flowering locally. Overall, the traps collect only a very small proportion of the hundreds of different species of shrubs, weeds, grasses and trees that flower throughout the growing season in the UK, because, as mentioned above, most of them do not get airborne. Most of the pollen species that appear on the slides are pollinated by the wind and are often produced in great quantity to ensure that at least some of the pollen reaches another flower of the same species. The air is also full of fungal spores at most times of the year. ▪	Sun: You already take care to avoid sunburn when the weather is warm, but you should also keep an eye out for ground-level ozone. 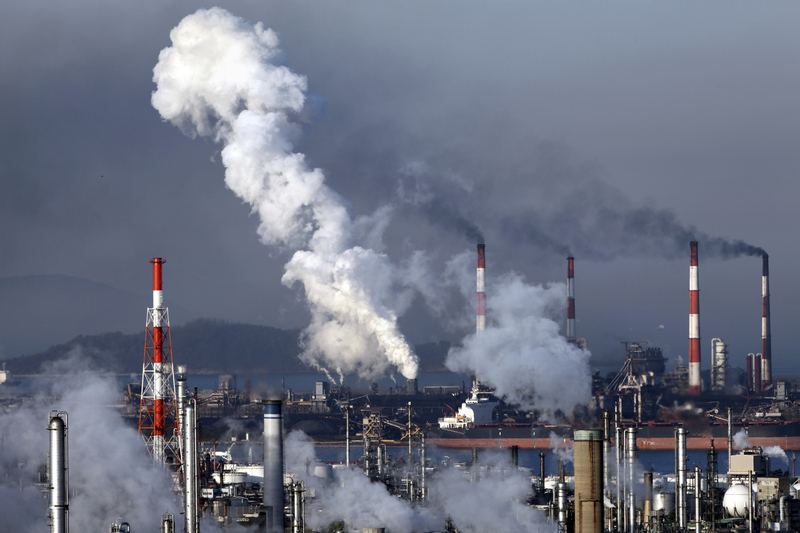 The production of this pollutant involves a reaction between ground-level exhaust gases and UV rays. ▪	The inversion layer: Generally speaking, the atmosphere gets colder as you get higher up. But in some cases, it can be hotter up there! This heat creates a “lid” of warm air in the atmosphere, called an inversion layer. This prevents pollutants from dispersing, meaning they stay trapped closer to the ground. ▪	As for the wind, it can scatter pollutants. It’s a fickle friend, sometimes staying calm when we most need it, but as far as air quality is concerned it can also be a vital ally! ▪	Ventilate your home on a daily basis: The ideal scenario would be to open all the external windows and doors for 10 to 15 minutes a day—whatever the season—so as to renew fully the air in your home. It’s also a good idea to ventilate after cooking or cleaning the house. Pro tip: Use the Plume Air Report to choose the best moment to ventilate when outdoor air pollution is lowest! ▪	Regularly clean the air vents in damp rooms: You’ll probably have one in your bathroom or kitchen. These vents can be super useful for controlling humidity in your home, but let’s be honest, what’s the point of having them if they’re always so filthy? ▪	Mold: Okay, so no one is saying you live in a hut in the woods. But even the cleanest houses can sometimes fall victim to mold. It emits volatile organic compounds (or VOCs) that can cause asthma and allergies, especially in children. One magical remedy: white vinegar and elbow grease! To prevent mold occurring before it even arrives, consider buying a dehumidifier. ▪	Household products: These can be crammed with irritating substances such as ink, glue or solvents. Research local environmental standards, and keep an eye out when reading the label! For example, the European ECOLABEL ensures that detergents contain less than 0.01% irritating substances. You can also use “allergy-proof” products – try looking for local co-operatives or brands. It’s better to go for multi-use products, to avoid combining multiple irritants. Make sure to store these products in a safe, ventilated area. Avoid sprays. When it doubt, the old remedies are the best ones. Try savon noir or white vinegar instead! ▪	Decorating baby’s room before the big day? Paints and other solvents used in painters’ products can emit VOCs. Allow time for them to disperse, and in order to limit their impact, ventilate like there’s no tomorrow! Ideally, undertake renovations in the summer—you’ll be able to ventilate longer. Make sure you still open your windows if it’s winter, as heating can help volatile organic compounds to spread. Don’t forget to close all containers immediately after use to avoid excessive levels of pollutants being released. ▪	Don’t smoke. You were hoping we’d forget to mention this one, huh? Never forget that tobacco smoke contains benzene, formaldehyde and particulate matter, all substances classified as carcinogenic and that worsen allergic reactions. Think of the children! If you do, have your cigarettes outside and clean thoroughly any textiles that come in contact with smoke on a regular basis! ▪	Be wary of home fragrances (such as incense, deodorisers and scented candles). They smell good, but many fragrances can be allergy-inducing. There are official lists of safe-to-use products, and harmful substances should be mentioned on product labels. ▪	Don’t overheat your home: Heat enables gas release, causing VOCs to spread even more widely. You’ll also save money! Heating your home just one degree less causes a 7% drop in consumption. The ideal indoor temperature is between 19°C and 21°C. ▪	Close the door between the garage and your house. This prevents particulate matter and nitrogen dioxide produced by your car from entering your home when you start your engine. ▪	Vacuum carpets and rugs regularly to eliminate mites. Remember to change the bags in your vacuum cleaner and opt for brands with quality filters. ▪	Close your windows if you are in heavy traffic. Set up closed-circuit air conditioning in order to recycle and filter the air in your vehicle. If you don’t have AC, it’s also possible to temporarily stop your car’s ventilation system in high pollution areas. ▪	Open your windows to clean out air pollution when driving down less congested streets!